Over the last few years, our event has raised over $100,000 for LOCAL charitable efforts. All the money raised goes directly to a designated charity in the greater Des Moines area. We choose three charities each year to receive the donated funds. However, if you have a charity that is near and dear to your heart, you may designate any charity that has a local affiliation. We need everyone’s help to make this annual event a success, whether it be by donating items to the Live Auction or Mall in the Hall, volunteering your time at the auction, shopping at the Mall in the Hall or bidding/buying at the Live Auction. If you have not been to Mall in the Hall – think of it as a huge garage sale for Quilters. It is the classic – “one person’s trash is another person’s treasure.” You can bring donations to the church between 1-4:30 p.m. that day. There will be runners available to take your items from you at your car if you wish. What can you donate? Just about anything sewing related. From a spool of thread to an antique quilt. Smaller items go to Mall in the Hall, larger value items (anything over $50) will go to the live auction. Many small groups pool their resources and create Auction Baskets. IMPORTANT: For higher value items – please put two index cards with each AUCTION item describing contents, donor and estimated value. After you’ve dropped off donations, you can purchase a snack in the Quilters Cafe from 3:00-5:00 while waiting for the doors to Mall in the Hall to open at 5:00. Enjoy shopping for bargains, then have a seat in the church and enjoy the real live auction. 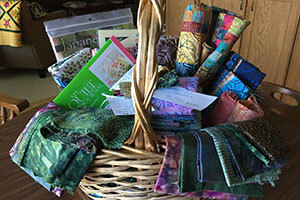 Bid often and generously for quilting things you will love. These are quilting purchases you’ll really feel good about, beacuse you’re scoring some wonderful quilting-related goods while also supporting amazing local charities. Thank you and with your help I’m sure this years’ auction will be another huge success! 5:00 – 6:00 Mall in Hall – Items of interest to anyone who sews. If you have not been to Mall in the Hall – think of it as a huge garage sale for quilters. 6:00 – Live Auction – Just about anything sewing and quilting related over $50 value, from quilt racks, to antique or modern quilts, baskets of new fat quarters or newish or vintage sewing machines and supplies. 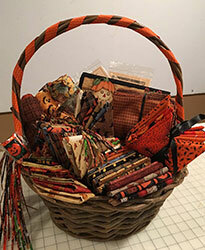 Small groups pool their resources and create themed Auction Baskets, table runners, or exquisite full size quilts.